Marlin engineers create designs for custom steel fabrications that improve operations for major automotive manufacturers and industrial customers all over the globe. Steel wire baskets with lids, in particular, are useful for wash/finish processes where the parts need to be rotated to get the best results. With a custom-designed lid, parts can be held securely without risk of being lost or damaged. Plain or with protective laminated surfaces. 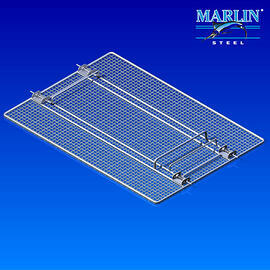 Specialty die cut, suspended sling systems that have a wide variety of coatings and specialty finishes. Total customer satisfaction is our goal. Also, because we maintain strict safety standards on top of using automated equipment that can run unattended at night, our factory stays up and running 24/7, enabling us to manufacture your products quickly with fast delivery. 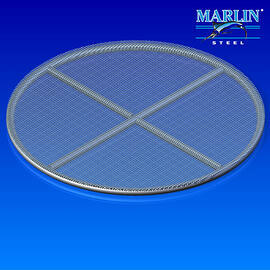 We design and engineer custom wire products in stainless, galvanized, and plain steel. We make thousands of custom steel baskets and racks each week. 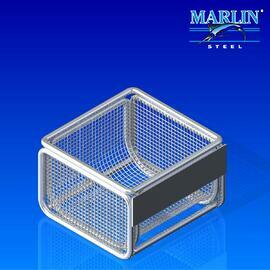 Submit your lidded custom wire basket requirements and a Marlin Steel employee will get back to you with a quote / more information.